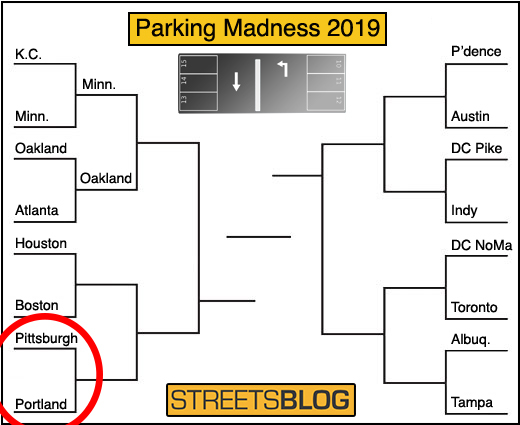 We’re continuing with our hunt for Most Improved Parking Crater today, slowly but surely narrowing down a list of 16 candidates to find the urban parking lot that has become a beloved cityscape rather than a cement crater filled with cars. Today’s matchup is a little different because it features two central civic spaces that were once nothing but asphalt. Before we get to it though, voting is still open for yesterday’s competition pitting Houston vs. Boston (Minnesota and Oakland have already moved onto the second round). 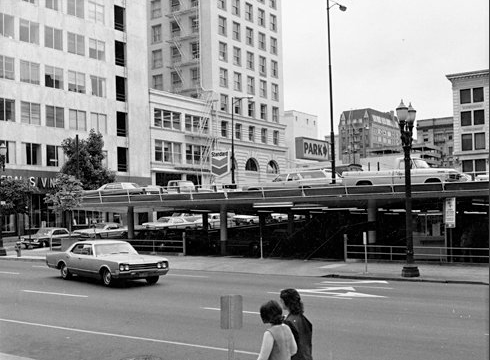 P-town’s Pioneer Courtyard Square was formerly a low-rise parking deck. 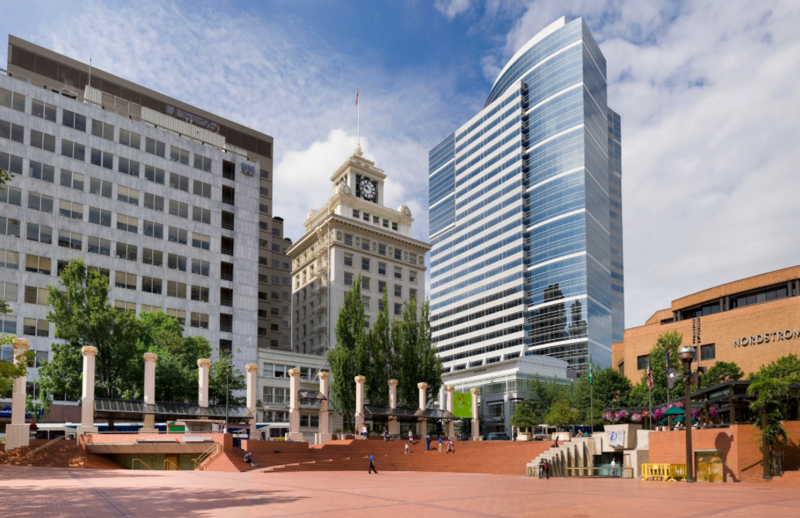 Pioneer Courtyard Square calls itself “Portland’s living room” and the city’s “most visited park.” The square hosts 300 programmed events per year, according to the nonprofit group that oversees the space. 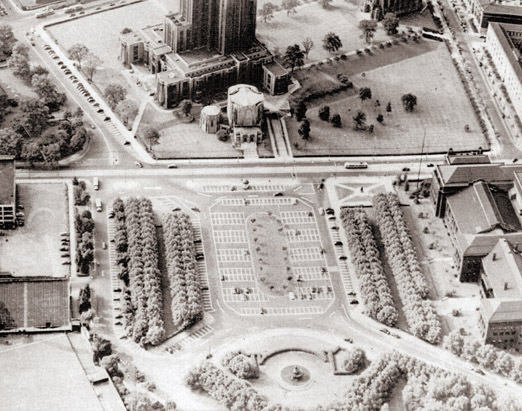 A similar conversion has taken place in Steel City’s famous Schenley Plaza. In addition to a one-acre green space, the park contains dining kiosks, a carousel, public restrooms and a full-service restaurant. In other words, it’s a big improvement over a parking lot. But can it top Pioneer Courthouse Square? Let us know which deserves to go on to the second round. Vote now! Please make sure to refer to our city as Minneapolis; we don’t live in “Minnesota, Minnesota.” None of the other cities are called their state. Well, to be fair. They did put the name of the city on the competition. They just got confused because they abbreviated it on the bracket, and Minn is also the old postal abbreviation (and still used in AP style guides) to mean Minnesota. Maybe they’ll be consistent and say “Indiana” for Indianapolis. To be fair with Pioneer Square, calling it the “most visited park” is like calling I 405 in LA the “city’s hottest nightspot”. Most of the time it’s fenced off for a private event, even though about half the bus lines and all of the light rail lines cross the square. It’s a hostile hostage situation Portlanders put up with. 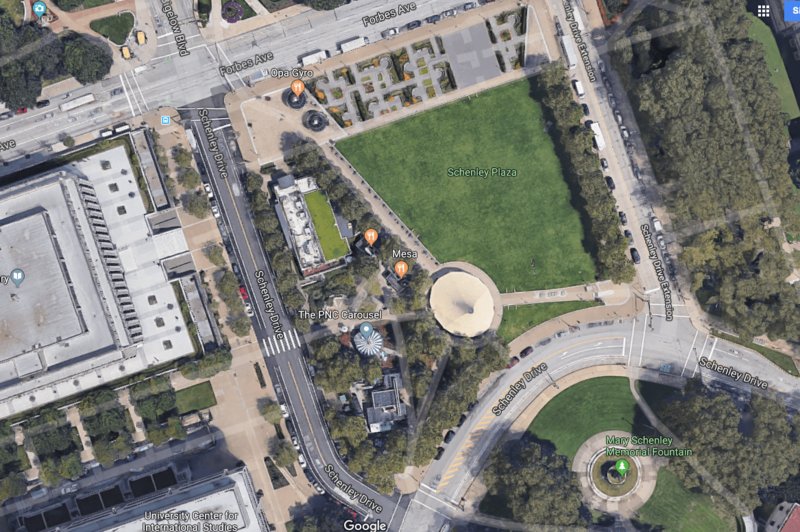 Maybe if it was actually an open square most of the time, it might be more of a destination than it is a really congested transit transfer point with the world’s most inconvenient event venue. An analogous situation would be, say, Grand Central Terminal or the Port Authority Terminal, except all the floor space is fenced off except the 20 feet closest to the wall while socialites have their own function behind the fence. Whoever’s writing this stuff needs to get aerial photos of both instead of an aerial of one site and not the other. It makes it very hard to judge fairly between the two sites and this has happened in multiple matchups here. Minnesota? Are you serious? You mean Minneapolis or Saint Paul? It’s fenced off like only 3 or 4 times a year for short stints. More like 8 or 10. but let’s say it’s 3 or 4. That’s still about 4 too many for literally the busiest spot in the city. Like, unless someone is bleeding out on the bricks, it needs to stay open, and even then, just like, rope off that part and let the rest of the city get on with its day. That would be nice but easier said than done. Some of the “before” photos are from before google. So that means finding a historical photo, any photo from any angle, that has been posted on the internet. There are some archives of historical aerial photos but those have spotty coverage, low resolution, or both. The previous “worst parking craters” playoff all used current aerial photos which can be easily obtained from web mapping tools. Fun fact – the closing scene of flashdance where she runs out of the dance hall and the guy is waiting of her https://www.youtube.com/watch?v=VzALZjoIx0g is shot between the two rows of trees on the right-hand side of the Pittsburgh photo. He’s waiting outside his car (even though you’re not allowed to drive there and probably weren’t back then). It is a beautiful spot today made even more beautiful by the development of the park where the parking lot used to be.